Weekly round-up of the Hebrew newspapers in Israel; covering the major events happening in Israel and the Middle East. The vast majority of the news coverage in the Israeli papers on Wednesday is foreign news, leaving little room for domestic coverage. Most of the Israeli newspapers lead their Wednesday editions with the New Zealand earthquake, in which dozens of people – including, it now seems, three or four Israelis – were killed. The papers report that Israel has offered to send disaster relief to New Zealand. The only paper which did not lead with New Zealand is Haaretz, which continues to lead with events in Libya. 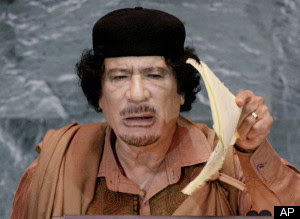 According to the paper’s lead headline – which also appears on the front pages of the rest of the papers – Qadhafi has vowed to remain in his country and fight to the last bullet, rather than cede control. Yedioth Ahronoth, Maariv and Israel Hayom dailies all have banner headlines, proclaiming that Mu‘ammar Qadhafi’s regime is on the brink of collapse and that, in the final throes of its existence, it is lashing out at anti-government protestors. According to the lead headline in Haaretz, upward of 600 people have been killed in protests across Libya. The paper goes on to say that counter-measures have included Libyan air force jets bombing civilians and tanks shelling demonstrators. Egypt stated Monday that allowing the ships to pass did not signal a change in its policies, because it was obliged under international law to do so. 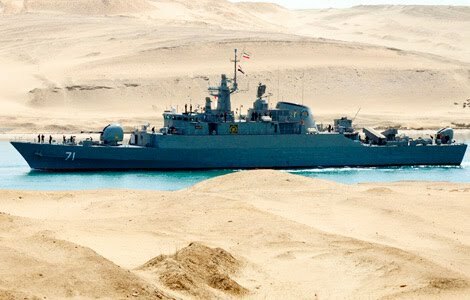 There has been concern in Israel and elsewhere that the permission for the Iranian ships passage signals a rapprochement between Iran and Egypt, following the revolution against Husni Mubarak. But the Israeli daily Maariv reported on Wednesday, citing security sources. The sources told the paper: "Estimates indicate the two ships are carrying missiles of different range, rifles, ammunition, and night-vision gear... The voyage of the two ships is an Iranian attempt to go around the arms embargo on Hezbollah." The paper also said that it is believed the voyage is an attempt on the part of the Iranians to "test the waters" with and gauge the responses of the Egyptian Supreme Military Council and its stance towards Tehran. Elsewhere, The Jerusalem Post reports on its website that a test late Monday evening of the upgraded Arrow anti-missile missile on the West Coast of the United States has been a success. The 18th test of a missile in the Arrow family covered improvements intended to help Israel deal more efficiently with future threats. It complements a test which took place in April 2009. The Green Pine radar system detected the threat, which was launched from a platform in the Pacific Ocean. The information was relayed to the Arrow launcher, and the missile downed the threatening target. Meanwhile, Israel Hayom reports that Netanyahu met with reserve general (and Israel Hayom commentator) Yaakov Amidror on Monday evening, as part of his effort to find a replacement for National Security Advisor Uzi Arad, who announced his resignation on Monday. The Prime Minister's Office confirmed the meeting, calling Amidror ‘one of the leading candidates’. A statement by the office said that Netanyahu will meet with other candidates and announce his final decision in the next few days. The fallout from the U.S. veto at the UN continues to make headlines in the Israeli press – on both sides of the Israeli-Palestinian divide. On the Israeli side, Haaretz reports that the Jerusalem planning and building committee took three plans for construction in Jewish neighborhoods of East Jerusalem off its agenda, saying that the plans were not yet ripe for discussion. However, the paper hints in its headline that this may be an Israeli gesture to the Obama administration, to ‘thank’ it for vetoing the United Nations Security Council resolution condemning settlement activity. Palestinian Prime Minister Salam Fayyad, meanwhile, says he is willing to travel to Gaza in the interest of reconciliation between Fateh and Hamas, even at the risk of conceding security control in Gaza to Hamas. Speaking to Palestinian journalists, Fayyad said a unity government would precede reconciliation. Regarding relations with the United States, Fayyad said the U.S. tried to stop the PA from submitting condemnation of Israel to the United Nations because the PA is weaker than Israel. He said the PA was angered because the U.S. wanted it to change its position in a disparaging way, and that the PA could not be bought by U.S. economic aid. And in parliamentary news, Netanyahu decided Monday to give members of his Likud faction freedom to vote on the establishment of committees of inquiry into the funding of left-wing NGOs. Following Netanyahu's decision, Foreign Minister Avigdor Lieberman’s Yisrael Beiteinu faction – which had proposed the committees – asked for the vote to be postponed. Since it appears that most MKs are opposed to the probes, which have been criticized as McCarthyist, Netanyahu’s move effectively killed them off, prompting Maariv to headline the news on its front page: Bibi’s revenge. Inside, the paper explains that, after Lieberman announced on live television that he opposed Netanyahu’s selection as the next ambassador to London, relations between the two leaders have been strained. The paper goes on to say that Netanyahu took this opportunity to ‘repay’ his foreign minister by nixing the probe that, in any case, he was opposed to. In a related move, the Knesset passed Monday legislation requiring NGOs to issue quarterly reports about funding they receive from foreign governments, and say whether they are supported by other countries on their websites and in advertisements. The bill, which was sponsored by coalition chairman Zeev Elkin of the Likud, passed its final reading in a 40 to 34 vote. Very interesting Linda, keep up the good work; you are the best!